I know that God has led me into leading a Women's Support Ministry BUT ... its a bit unusual as the lessons we learn will be enhanced and strengthened with the assistance of horses. 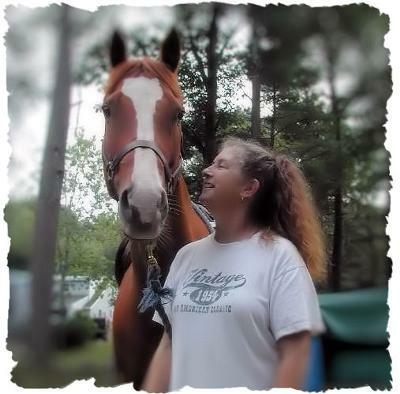 Over the years of working with women and horses in a more secular manner I've found that many, without my saying a word about Christ or Salvation, have come to know Jesus in a VERY personal way that has become life changing for them. I feel now that God wants me to offer more "formal" classes/programs/support and through looking here in this awesome website I've found a few things that I feel would be so beneficial for the women who will be gracing our farm each week. There is SO much here that I am praying that God will let me know just where to start first. I feel for women who have, as most do, self esteem issues, identity issues, boundary issues, abuse issues and more. You know ... the kids have grown and left home; the hubby is involved and tired in his lifetime of employment and the wife is left with, "What NOW!?!?!? What is my purpose NOW?" Anyone who might be able to offer some support/suggestions/prayers/insight/INSTRUCTION for me in my quest forward with this path that God has laid before me is MOST WELCOME. I thank you, in advance, for your prayers as I know they will come to me with love and strength and the spritual "knowing" of what to do that I need through the secret wisdom of the Holy Spirit in my heart. The students are advised not to involve in any kind of political activity at http://www.topessayservices.com/essay-services/ in their student life. This may result in some serious consequences like rustication. I would just like to encourage you in your pursuit of ministering to women with the support of horsemanship ----- Remuda Ranch in Wickenberg, AZ uses horses as part of their therapy for women with eating disorders. Though I was skeptical, after receiving treatment for a life-threatening eating disorder, I saw the value of both learning to groom and to ride the horses. I can't detail all of it right now but I will say that there is a great deal of healing that can take place through this type of ministry. Thanks for your encouragement! I agree wholeheartedly with you. I did, however, just enroll in the American Assoc. of Christian Counselors Foundation University of Light to work through and obtain my Certificate in Women's Ministries and Counseling. I am excited about this and so looking forward to being able to offer and help even more so than in the past. My name is Ameerah and I am the founder of The Hem Bible Studies. I've written most of the lessons that you'll find on this website, and I believe that God has been able to use it to do great work for His kingdom...and I have NO formal training! I just wanted to take a second to encourage you. You know, it's man who says that we need a certain license or some particular training to serve the Lord. But Paul had and Peter had no particular training. But, what they did have was an intimate relationship with God and the ability to listen to the voice of the Holy Spirit instructing and guiding them in their daily lives. God's Word tells us that the Holy Spirit is to be our first teacher. He will train you and qualify you for the calling that He places on your life. Now, I'm not saying that you should not get formal training. Just that you should not get it just because you "think" you need it to serve the Lord in ministry. The Holy Spirit will guide you to the training that He wants you to have, if He wants you to have some. He may send someone to this site to recommend something specific, and when you hear their recommendations, you feel a since of peace and something in your spirit affirms that it's God's will for you. Or, you may be searching the internet and all of a sudden you find something and you feel in your heart - That's It! I'm so passionate about this because I've gone through a similar journey. I have no formal training in ministry, and for a while I felt inadequate to do what God was calling me to do. Even once I started the site, I kept thinking that I needed to go and get some kind of certification or license so that people took me seriously. But, then I realized that I'm not the person drawing the people to this ministry - God is sending them. And, it's His responsibility to impress them, not mine. I may eventually decide to go and get "formal training," but I know that's not what qualifies me to serve God's people. It is His Spirit that qualifies me, just as it does you. I'm excited about your new ministry, Gwenyth. And I believe that God is going to use you to bless a lot of women.